World No. 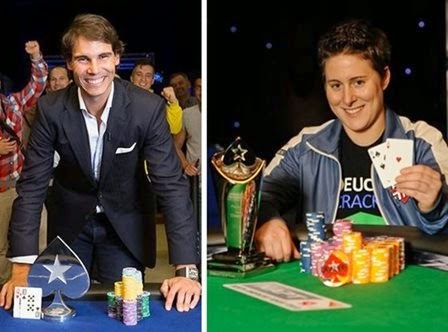 1 Rafa Nadal and PokerStars ambassador will face the world's best female poker player, Vanessa Selbt in a game at Casino de Monte Carlo on Friday April 11, 2004. Rafa Nadal will be in Monaco to compete in the ATP Monte Carlo Masters tournament. While staying at the Côte d'Azur he will take on Team PokerStars Pro Vanessa Selbst in a one-on-one poker game. This is an opportunity for Nadal to build on his charity poker tournament win last December, when he beat Brazilian football legend Ronaldo and one of the best poker players in the world, Daniel Negreanu. Both Nadal and Selbst are well known for being extremely focused and determined competitors, who possess the strategic technical ability to succeed. Their coming together will prove a fascinating battle of minds. Vanessa Selbst is the highest-earning female poker player of all time with over $9.6 million in poker winnings – playing at 28 final tables and winning 13 tournaments, including two World Series of Poker bracelets. In her time away from poker, Selbst has completed a law degree at Yale.